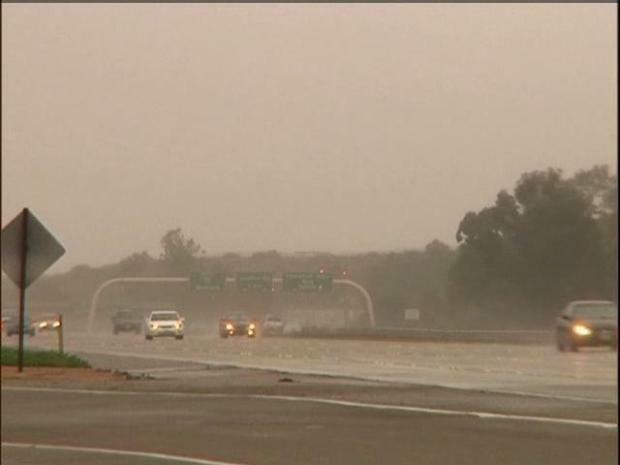 California was getting a steady drenching early Sunday, as the first wave of a potentially damaging storm washes across the region. Central California is getting hit the hardest and San Diego County the lightest. Officials were preparing for possible mudslides in Los Angeles, Ventura and Santa Barbara counties and were posting mudflow warnings. Forecasters say the storms could be the largest system the region has seen in the last decade. On-and-off showers in San Diego were likely to become heavier Sunday into Monday. On what is traditionally the busiest shopping weekend of the year, the weather does not seem to be keeping the crowds away from local malls. "You know what, the shoppers, it doesn't matter. They're here for the sales. They're here for Santa. They're here to get their presents," said Carlsbad Premium Outlets spokesperson Crysta Campbell. The storms could be the largest system the region has seen in the last decade. In Downtown Escondido, store owner Chris Gulliver says rain can sometimes keep customers away, but not this time of year. "People got to get out and do last minute shopping. So, I don't think a little bit of rain will keep them away right before Christmas," Gulliver said. This is a warm storm, originating west of Hawaii. Sub-tropical in nature and delivered by the jet stream, it is moisture packed but, again, mild temperature-wise. For the most part we're looking at lows in the low 50s and highs in the low 60s. In our mountains, we're not looking at freezing temps until probably Tuesday so that means rain rather than snow. Rain does not seem to be keeping crowds away from malls. The heaviest part of the storm system is north of Los Angeles. From Santa Barbara to San Francisco there will be periods of very heavy rainfall stretching east across the Central Valley and on into the Sierra Nevada where they could see snow accumulations between 10 and 15 feet. Temperatures up around Big Bear and Wrightwood are mostly in the 40s. That too means rain instead of snow, which is not good news for the ski resorts. This could change come midweek when a colder air mass may move in along with the heaviest of the rainfall for Southern California. There is a possibility of heavy snow down to about 5,000 feet, which would mean some white-stuff in our local mountains along with much improved conditions at Snow Summit, Bear Mt and Mt. High. The storms are expected to move east by Thursday but another series of similar storms could be upon us as early as next Saturday night.